Congratulations Crystal Tomato for making a global debut! Thank you for inviting me to your global debut to share on your products as well! What is this Crystal Tomato? Well it works as a daily beauty regimen, which has a power boost with a one-a-day dietary supplement containing Crystal Tomato® Carotenoids, one of nature’s most effective whitening ingredients. Rebranded locally as Crystal Tomato® Plus, the product is a result of a decade of research and development. The supplement is made from Natural and Pure freeze-dried Crystal Tomato® Powder, free of preservatives. 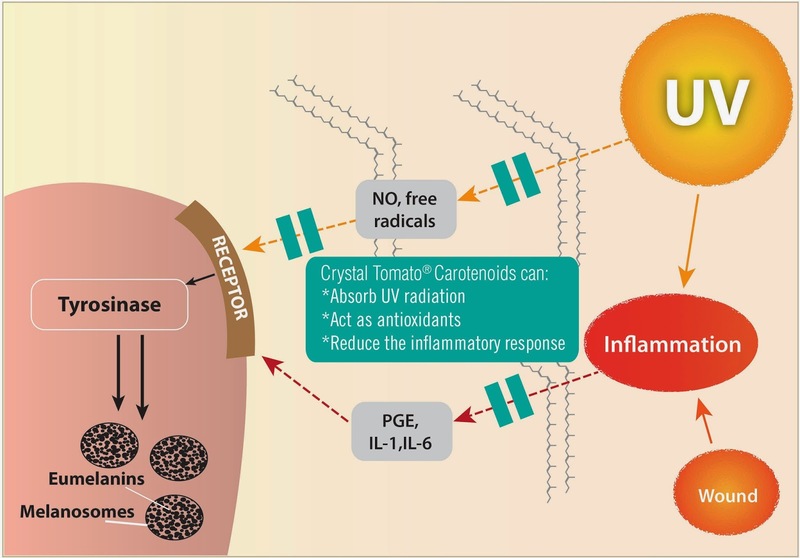 Crystal Tomato® Carotenoids are the first molecules produced in the sequence process in the tomato plant to create carotenoids, which primarily function as anti-oxidants. The special rare breeds of tomato used by Crystal Tomato. 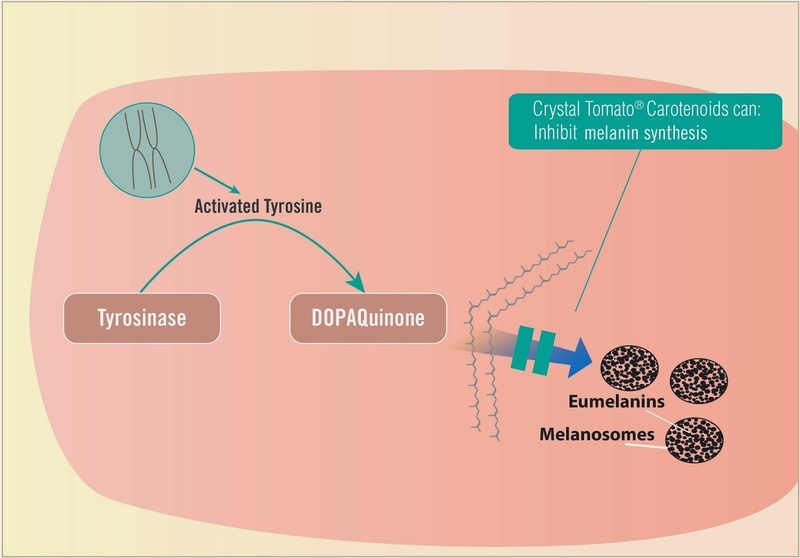 Crystal Tomato Carotenoids can block triggers of melanin synthesis. Crystal Tomato Carotenoids can inhibit melanin synthesis. L-Cysteine, an amino acid, is also included in the supplement to increase the efficacy of Crystal Tomato® Plus. This is one of the few amino acids that are able to bond in a special way to maintain the structure of proteins in the body and help in the formation of collagen, hence promoting healthy skin. L-Cysteine also helps to boost the liver’s production of Gluthatione, commonly referred to as the body’s master anti-oxidant. Without Gluthatione, cells will die at a faster rate, leading to quicker ageing. Gluthatione also has the ability to lighten dark skin and pigmentation, by altering the melanocytes’ metabolic processes to produce light pink melanin instead of dark or black melanin. Although Gluthatione is commonly found in oral supplements, it is not absorbed when taken orally and has no effect on the skin. By including L-Cysteine, a natural precursor of Glutathione in Crystal Tomato® Plus, the natural mechanisms in the body are activated to produce its own Glutathione to improve the appearance of the skin. + L-Cysteine, an amino acid present in our body, is included in Crystal Tomato® Supplement to enhance the efficacies of Crystal Tomato® Carotenoids. + L-Cysteine (amino acids present in our body) is a US FDA approved food addictive. + Certified HALAL by IFANCA (Islamic Food and Nutrition Council of America). + Crystal Tomato® Plus is manufactured in a Good Manufacturing Practice (GMP) & TGA certified laboratory in the United States of America. + Additional precautionary measures to ensure that Crystal Tomato® Plus caplets are 100% safe for human consumption, the founder, Gromark Consumers Enterprise Pte Ltd, Singapore conducts regular checks and analyses via SGS Singapore against microbial and heavy metal contaminations. + Packaging: 10 caplets per blister, 3 blisters per box (30 caplets for 1 month supply). + Each Crystal Tomato® Plus caplet is individually protected in double layered foil blister to ensure Freshness of each caplet until consumed. Crystal Tomato® Plus and Crystal Clear™ Skin Clarity Cream are used not only by man-on-the street but also loved by Royalties, renowned celebrities, wives of famous politicians, queens and princesses. Crystal Tomato Plus® is now available at aesthetic medical clinics at RM480 for a box of 30 caplets. Well thats all for now. Theres a lot of technical facts explain, thus the technical details to be covered within this blog post. So basically what it does would be that it lightens your skin tone and that you must constantly eat 1 a day to maintain the tone. Personally i find it very expensive but if you're looking for instant effects, well, it works within 2 weeks and you can see that your skin becomes fairer. Hey y'all, aren't we all happy that it already the weekend? Like finally! And if you have no plans, why not drop by Kuala Lumpur Big Kitchen Festival 2015 where they will have food, entertainment and definitely a guaranteed gastronomic gathering. 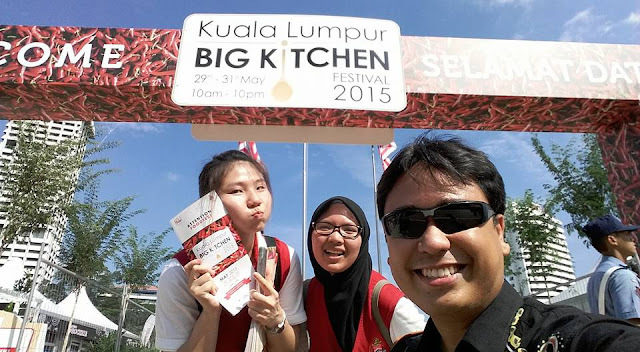 The KL Big Kitchen Festival 2015 is a fun-filled 3-day festival that will satiate the foodie in you! With more than just tons of appetising food, there will be a host of lifestyle & cultural performances and exciting competitions for everyone. Visitors who are there, will have the opportunity to attend all the cooking workshops and demonstrations (based on a first-come, first-served basis as seats may be limited), listen to the gastronomic talks and be entertained by the cultural performances. So like, theres pretty much nothing that you should miss at this event. But of course, is it free? Well, the answer to that would be is you might need to pay an entry fee of RM1 for adults or 50 cents for a child. Also, food items may be purchased using “Kupang”, which are specially designed tokens that will replace the need for cash at the festival. Talk about going back in time, the “Kupangs” will be available in denominations of half Kupang, one Kupang and five Kupang. The Kupangs can be purchased at the ticketing booth near the main entrance to the festival venue. The term “Kupang” is taken from the traditional Malay coin currency that was used in the Malay Peninsula since over a century ago. So instead of saying ringgit, they will only receive payment in Kupang, which i think its really cute! 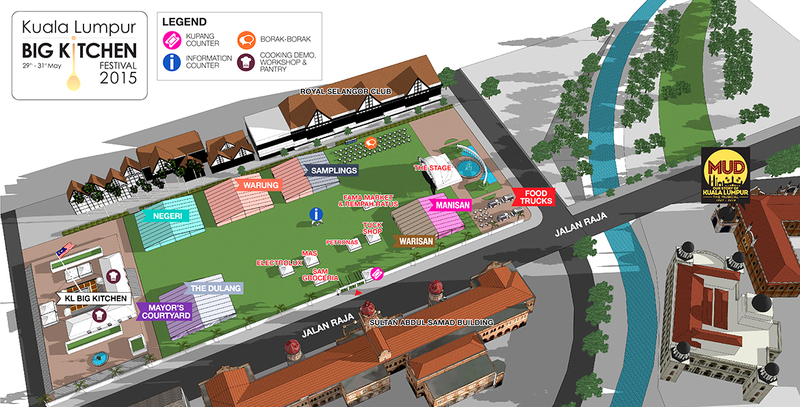 The KL Big Kitchen Festival will feature 8 unique and interesting villages for you to explore. Each village represents the different areas of gastronomic experiences and will feature various foods and activities unique and special to its kind. While some villages will have an al-fresco open-air setting, others may be tented with air-conditioning. And its not usual that you get to see an event happening at our historic Merdeka Square, so why not drop by and have some fun? 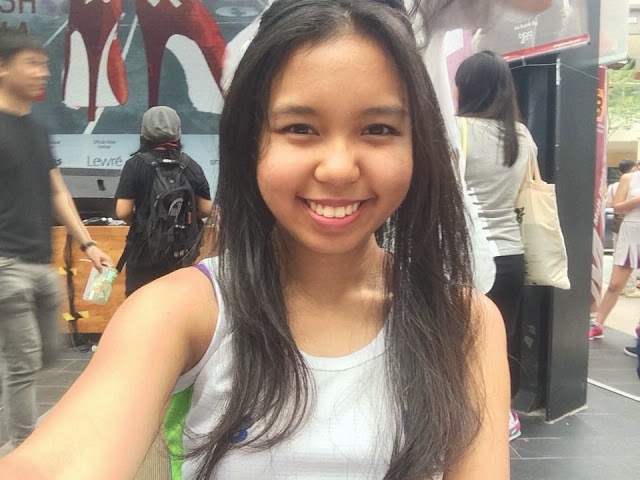 Here are some photos i took from some KL Ambssadors, with permission of course to just share to you what its like to be there. And apparently, the view of the place at night is amazing! But let me warn you, cause if you're planning to come at night, the food might run out. So better plan your day ahead if your planning to buy some scrumptious food at the event. Hope you found this post informative! The Launch of Belief, believe in truth. Olla, im sure youre wondering why Belief’s tag line is believe in the truth? Well, I had the same thought when I first heard of it. And of course, as corny as it sounds, its because they believe in believing in the truth. Without believe, there is no truth, right? So there you have it. A product that you can believe in miracles. *Queue’s rainbow* LOL. Belief comes from Korea, which I think seems pretty obvious as the market of skin care products in Malaysia are highly interested in Korean products. Earlier this month, I was invited to the media launch of belief by the Butterfly Project and the PR team of Belief, so I would like to take this opportunity to thank you for having me at the media launch. 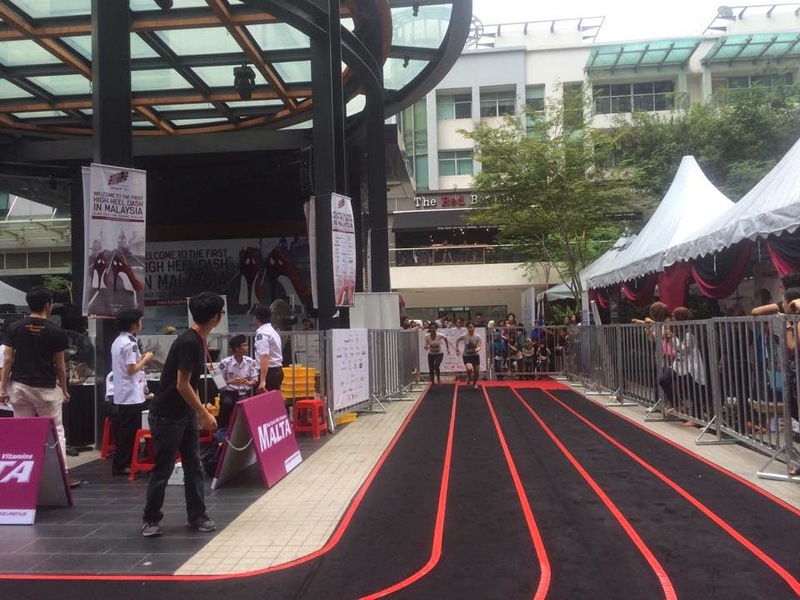 It was held at their first ever store in Malaysia, Sunway Pyramid. Congratulations on your launch Belief, and don’t you think their store looks amazing? Looks like a laboratory to me. Clean and super professional. What makes Belief unique? Let me spill the beans, they basically have a unique formulating philosophy that marries apothecary traditions and cutting-edge of Korean skincare technology, which has gained loyalty and respect of the worlds most infamously demanding skincare consumers. By now, its safe to say that Korea is well known as the epicentre of new skincare trends. We all know that Koreans do have skincare regimens involving the use of numerous products everyday, but belief embraces a powerful 4-step regiment that distills skincare down to care needs. At the launch, we had Ben Foo explaining to us about the latest innovation of skincare by Belief and the from the tag line itself, the simple honesty of the brands formulating philosophy has paid off. Belief is known as the authority in hydration and has big plans on becoming the hydration leader in the US as well. Its a cushiony luxurious and intensely hydrating cream. Its a refreshing, soothing and moisturising gel cream. The Success of these beautifully textured formulas is all the more notable in Korea, where hydration is a key skincare concern. Did you know that the Moisture bomb has the distinction of being the number one sku in prestige, across all categories of beauty in Korea? Well, now you do, and how amazing is that. Belief distinguishes itself with packaging that is transparent about key ingredients. 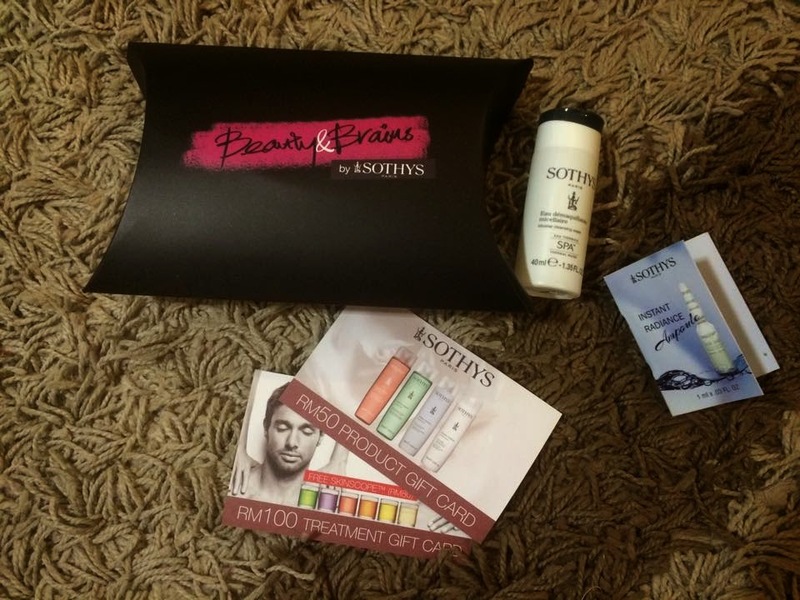 Each of its product ranges from RM45 to RM260 and on each packaging addresses diverse skin type and concerns. Their formula's are specially designed to be free of mineral oil, synthetic fragrances, synthetic dyes, synthetic preservatives and animal origin ingredients. For more information on Belief, do not hesitate to visit their official website. The main entrance to Daisuke Salon De Coiffure. Is it just me or the weather it getting pretty confused lately? With the sudden rain and trenching hot sun we have right here in Malaysia, its always important to keep our scalp protected. Being the most exposed part to the sun, how do we pamper our scalp after trying so hard to bare the direct sun? Well, i guess thats why you're here! To find out whats this CO2 Spa treatment like. Let me just share you my experience at Daisuke Salon De Coiffure. Private rooms for customers who prefers a private room. From the photos above, you can tell that this isn't any ordinary Salon. It was very clean, spacious and i just simply loved whole theme of it. It felt like a retreat to the free and easy life of the world, compared to the ever busy salon's who are constantly rushing to complete serving each customer in a short period of time. This felt very at home to be honest. The employee's at the shop greeted me in a very friendly tone and the minute i stepped into the salon, i was served with a welcoming Japanese brown rice tea! And to ladies who wears scarfs, they actually took consideration to have a private room for you to be served at in order of respect. How cool is that? My Japanese brown tea, served hot. The cool decorations that caught my attention. More decorations on the wall. How the decorations look to compliment the environment. this is me getting excited over my CO2 Spa Treatment. And of course, from my face, i guess you could tell how excited i was to get my first ever CO2 Spa treatment done at Daisuke Salon De Coiffure. But of course, I'm sure we all are curious about whats the difference between a normal hair wash and a CO2 Spa treatment wash? And guess what, i have the answers cause they had lovely employee's who were kind enough to explain it to me and who are able to find me the right answers to my questions. So, from the photos above, i think it pretty much explains everything that you need to know in an overall, but since you're still reading, i'll explain it in my way so that you can enjoy reading whatever i write here. Hehe. Anyway, the CO2 Spa Treatment would be charged at only RM28 which i think the price is really reasonable. And the difference between a normal hair wash and a CO2 spa treatment, is that the CO2 spa treatment removes and literally cleans all the smell and chemicals away from your hair instantly! BEFORE: Oil and Dirt without using Soda Spa Foam during the CO2 wash.
AFTER: The result after using Soda Spa Foam with CO2 wash.
As disgusting as it looks, i think it explains the results on what the CO2 Spa treatment does. It literally removes the oil, the dirt and also dead skin from your head. I was also told that it reduces dandruff if you have dandruff issues on your head. The special feature of the CO2 Spa Treatment is that they use a special machine that changes water to CO2 which is used to wash and rinse your hair during the spa treatment. The Soda Spa Foam was applied after shampooing and was left for about 5 minutes before rinsing everything off. The CO2 treatment felt like it was fizzy during the wash but it was very VERY relaxing because the pressure felt just right. Did you also know that the Japanese truly enjoys CO2 treatments? Because the results of CO2 treatments would be that it deep cleanses to reduce scalp itchiness, eradicates harmful chemicals, optimises the results of hair colour and perming and also widens blood capillaries to boost and improve blood circulation. And the final outcome thanks to Wen right here for getting me all dolled up to start my day. The session roughly took me an hour and after the treatment, i would say that my feels so much lighter. Thank you Wen for getting me all ready for the day and also, i can't wait to see you soon! Im in the mids of my finals, therefore I'm struggling with time at the moment to pay a visit. Cant wait for my second visit to this salon! Other products that are imported from Japan. Well, if you have any other enquiries, do not hesitate to leave a comment below OR check Daisuke Salon De Coiffure's official Facebook page. You can also PM them through Facebook, and they are kind enough to reply to any of your enquiries. Their customer service is definitely on top. Good job guys! Thank you so much for having me to review the place Daisuke Salon De Coiffure. I hope you enjoy reading this review, and i will be getting my hair colour done FOR THE FIRST TIME at Daisuke Salon De Coiffure again. Cant wait to tell you all about it. Till then. If you're on my social networks, I'm pretty sure that you would know that i was one of the runners for the high heel dash and let me tell you that it was an amazing experience. 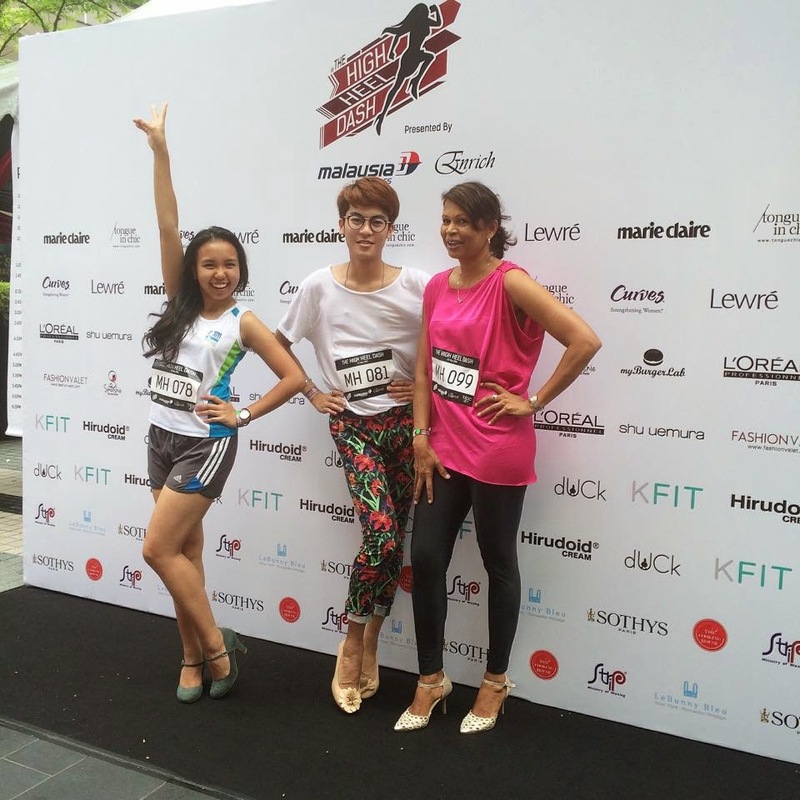 Its not very common to have any race in heels and at the same time, it pretty much test your time on how fast can you run in heels. (for occasions when I'm late for events or late for work) HAHA. Just in case, you'll never know right. Let me tell you a thing or two about the occasion. The race is a modern woman race in high heels, and in order to get to the top, women would constantly be on the run but at the same time, never failing to be stylish. This happens to be the FIRST High Heel Dash in Malaysia initiated by Bloc 48 in support of women empowerment for all ladies who want to shatter the glass ceiling. 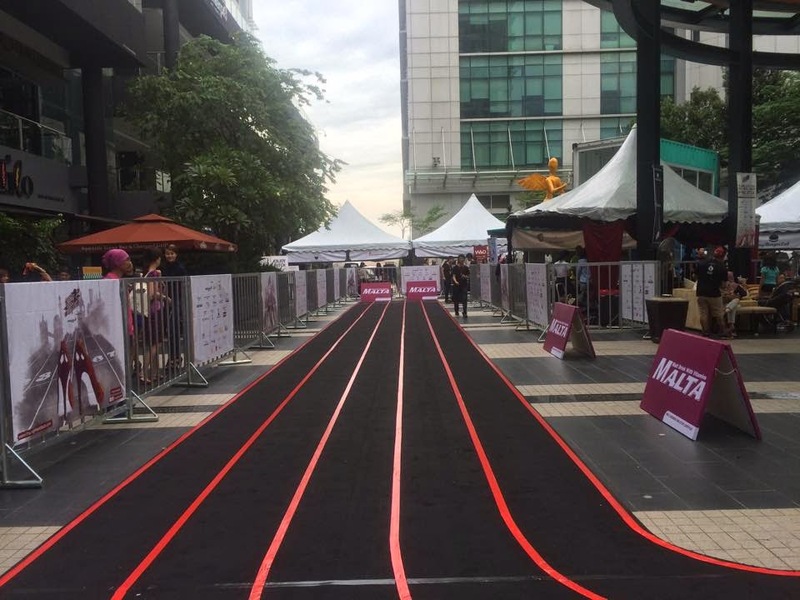 It was held in Publika Square, and what better way would it be by having a chic all-day event that brings together dasher to run 50m for a good cause? 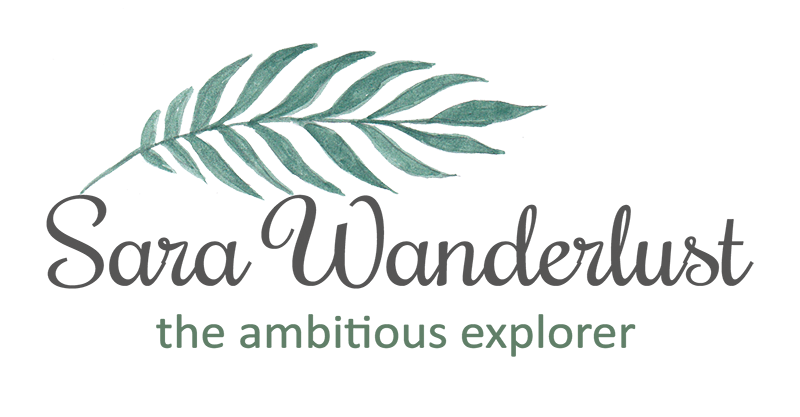 At the event, there was live entertainment, great food (healthy too), fabulous women-centric businesses and activities, plus amazing prizes in store to make this a dashing affair. 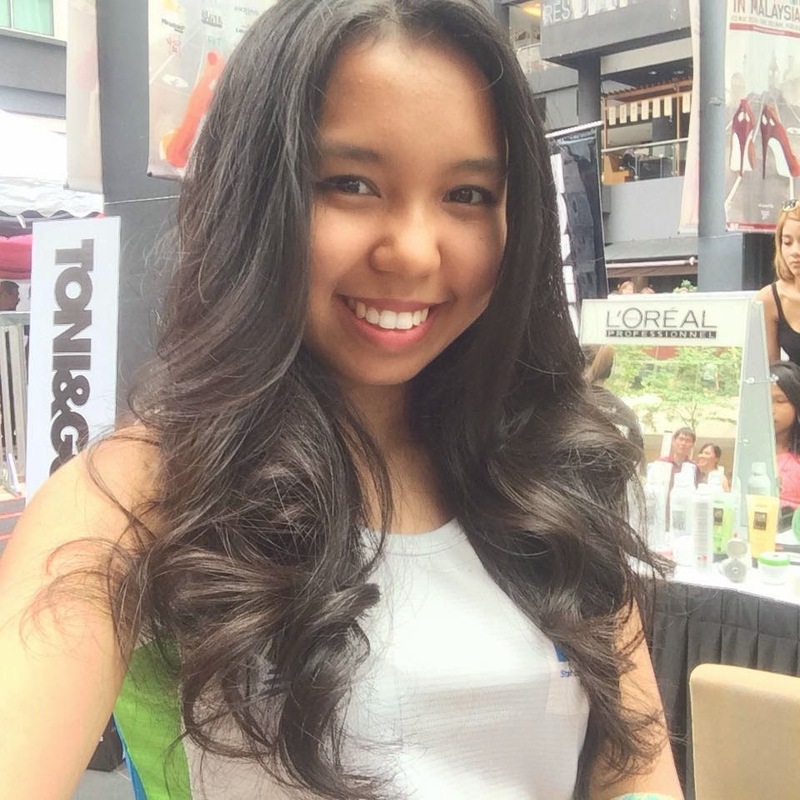 While waiting for my turn to run, i had some time to get my hair done by L'oreal who happens to be there, supporting the charitable event. Therefore, i hope that explains why my hair was so glam on stage to receive my award. 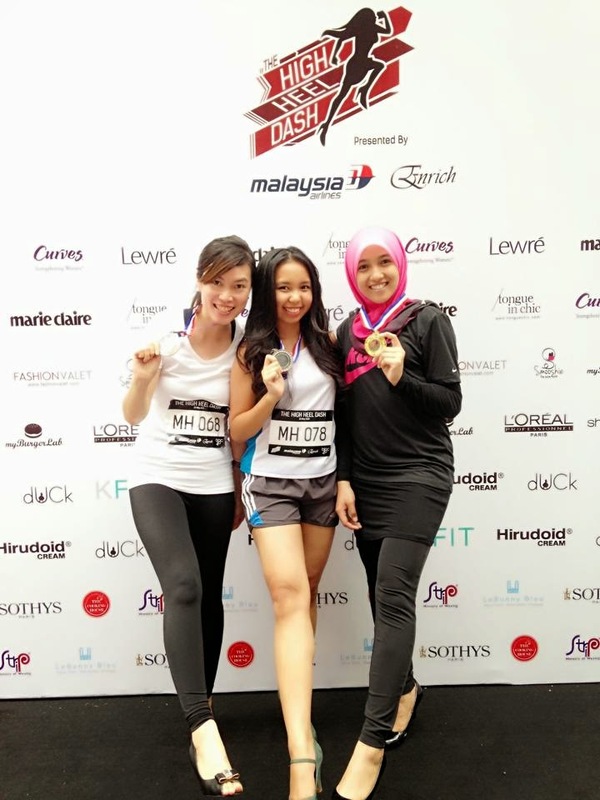 With L'oreal, it pretty much proves that even after running for a few times, and with all that amount of sweat you're sweating, at the end of the day, it still keeps you looking great! haha. After my hair was done = FABULOUSITY! To all the participants, we were able to get a bottle of smooshie for FREE. And it was yums. And of course, when it was my turn to run, i was really nervous i must say. There were 4 groups in total who needed to run and each group will have to run in a total of 3 times, with a distance of 50m for each round to see if they qualify for the finals. The reason why 3 times, was because they needed to record the best timing and see who deserves to be in the finals. Didn't think i would be in the finals, but guess what, when the finalist results were out, apparently i had one of the best timings! Now that was shocking to mentally know that you're so close to win the grand prize of a return flight to and from London sponsored by MAS. Here's a photo of how the race track looks like, it was very much challenging to run around the curb. The finalist from Category A. This event does not only help support women empowerment, but also benefit The Women's Aid Organisation (WAO) in their effort to provide a safe shelter for female vicious of abuse. So, yes, to be a part of this event, you would need to pay a fee of RM150 which a percentage of it would go to the WAO which i think was fair. 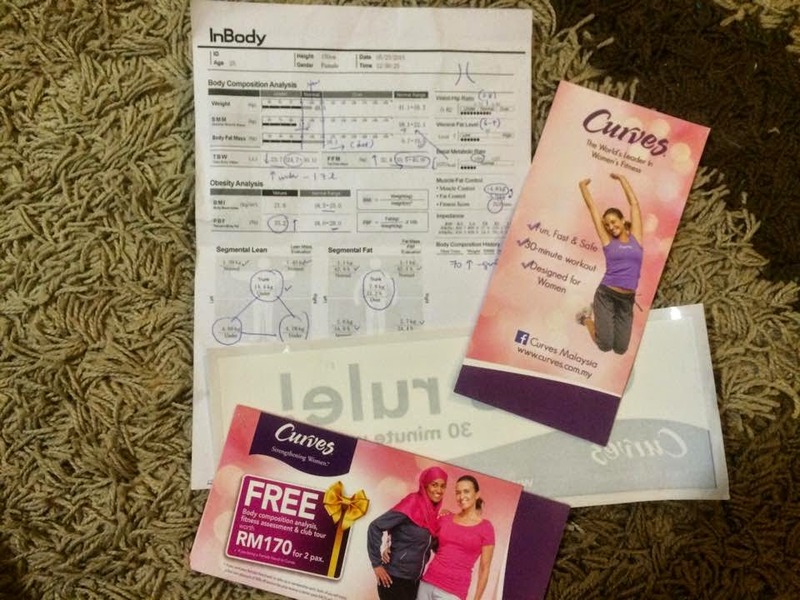 For a good cause, and if you don't win, you would still get a goodie bag worth over RM500 for just participating. So yes, it was finally the moment of truth. The final run was recorded, and here's the video of it. HAHA. and if you're wondering, I'm the runner on the 1st lane. And from the photos, I'm pretty sure that you can tell that i won in First Runner Up under Category A (18 years -30 years). 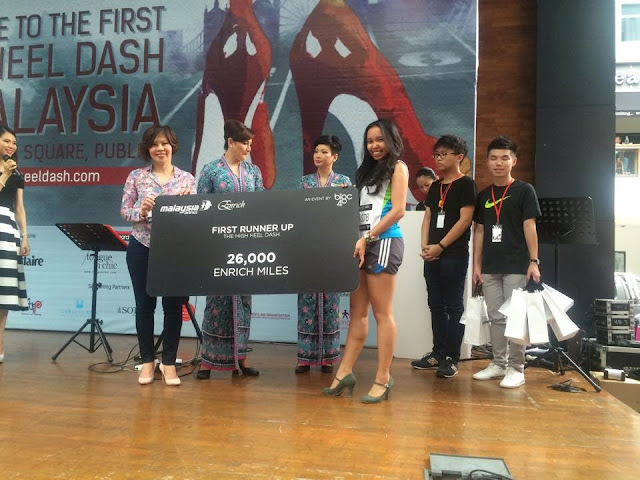 And to be honest, i didn't think i would get a medal and a trip to Seoul, Korea as i was only aware that the Grand Prize was return tickets to fly to London for 2 and the Second Prize would be return tickets to fly to Phuket for 2. 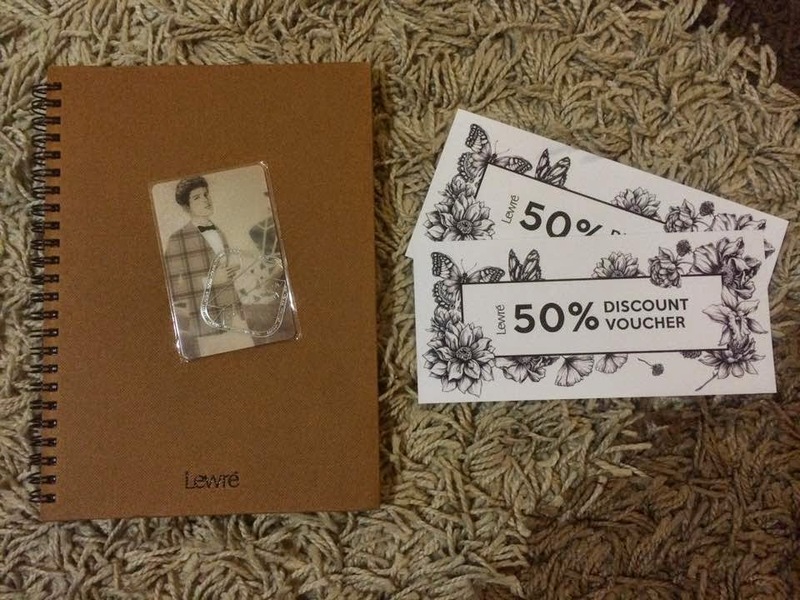 But to my surprise, there are also giving prizes to the Top 3 winners for each category. And i am thankful :) I made a lot of new friends since i came alone, and i thank my other blogger friends for wishing me luck during the run. Teehee. Here are some photos of friends that i've made along the way. And thats Chewit and Sima whom i met while waiting for my turn to run in Group 4. It was nice meeting y'all. And of course, if you're dying to know what we got in our goodie bag, here are the things that was in the bag which they were tons of vouchers, a scarf, a magazine and some MAS merchandises. Woop woop. 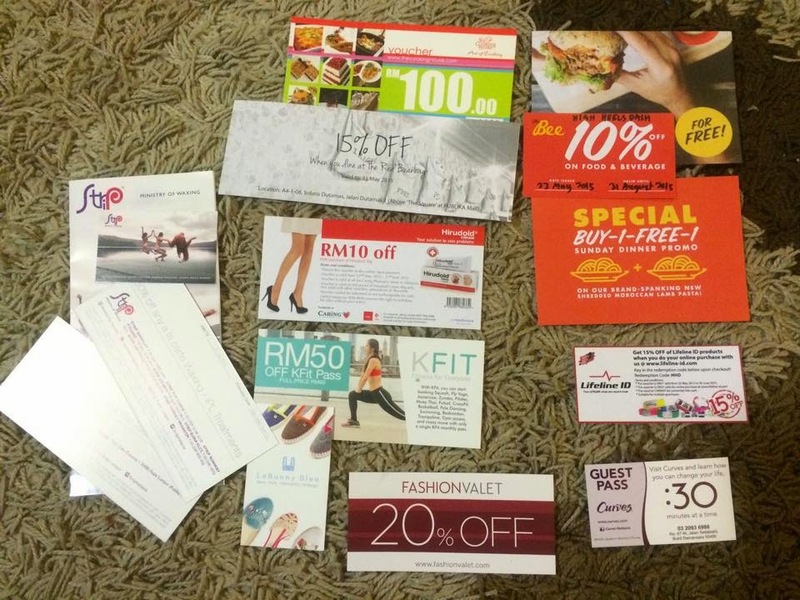 Can't wait to discover new products and go have meals for my vouchers. But to be honest, I'm not exactly the best person to keep updated with my vouchers. HAHA. Oh well, we'll see what i can do with them soon. 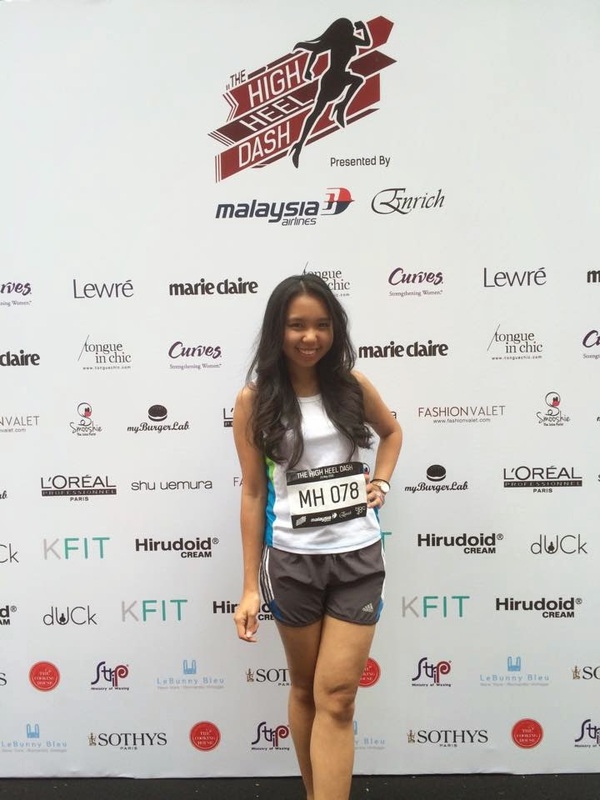 It was a really fun experience and i would be looking forward to the next High Heel Dash in 2016. Great job and i hope you made enough funds for the WAO. Thank you for having me in the run, and thank you for the generous goodie bag ! 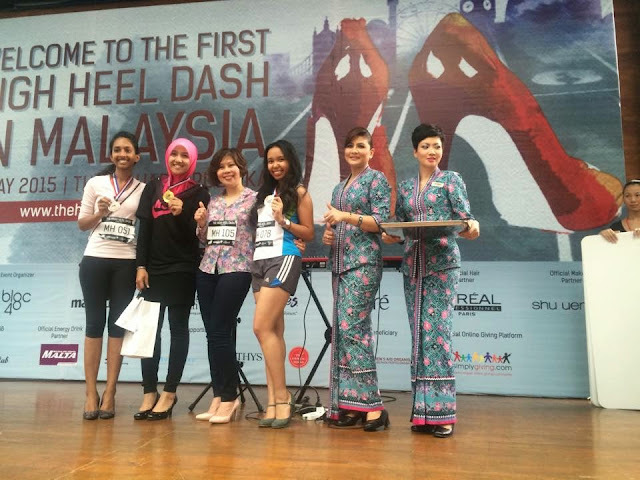 So if you're already thinking of signing up for the next High Heel Dash, do not forget to keep updated with their official website or their Facebook page. Thank you and i hope this wasn't too draggy to read. 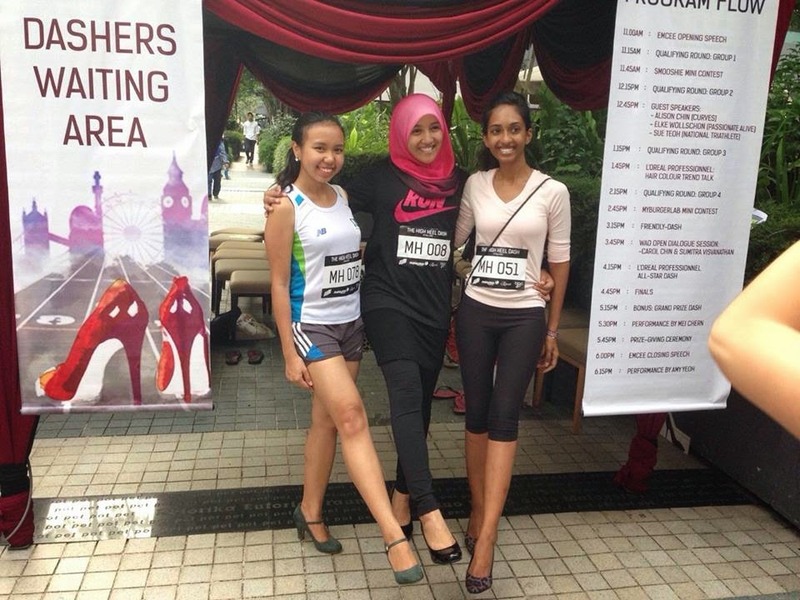 Me with Genelle and Murni showing off our heels who won us medals. The Bloggers BBQ Poolside Party! The authentic Italian Gelato, Sottozero.